Life is but a long buffet of snap judgments. Thus, one must find specific markers on which to hang their decisions. A man may be judged on his shoes, a restaurant on its bread, a priest on their depravity – but these are all qualitatively trivial when held to the light of one characteristic that offers an unequivocal amount of assurance upon the place or establishment of which one is judging……the loo. An establishment’s toilet is an enigma, it may go unseen by many, who simply never require its febrezed embrace, yet to others it is where they are most vulnerable, where the most evanescent and frivolous of details can make or break an individual’s experience. It is a locale’s heartbeat and ultimately the place that truly highlights somewhere that has done that extra bit to ensure it elevates itself from the general grey matter of that place we all call ‘out’. 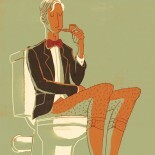 In light of this the Porcelain Gentleman has set out to review loo’s across the land. Pubs, clubs, bars, restaurants, pool halls, festivals, hotels – anywhere that has a room of rest shall be judged. In knowing the lavatories of the land you have a definitive guide to where you should be spending your time and some assurance on the pitfalls of the shitpits.